MELANIE MOWINSKI, Founder and Curator of PRESS is committed to sharing her love of art, book arts and printmaking with as many people as possible. When she was given a Vandercook Universal III in March 2010, she knew it had to be shared somehow and someway with students at MCLA, and the greater North Adams Community. 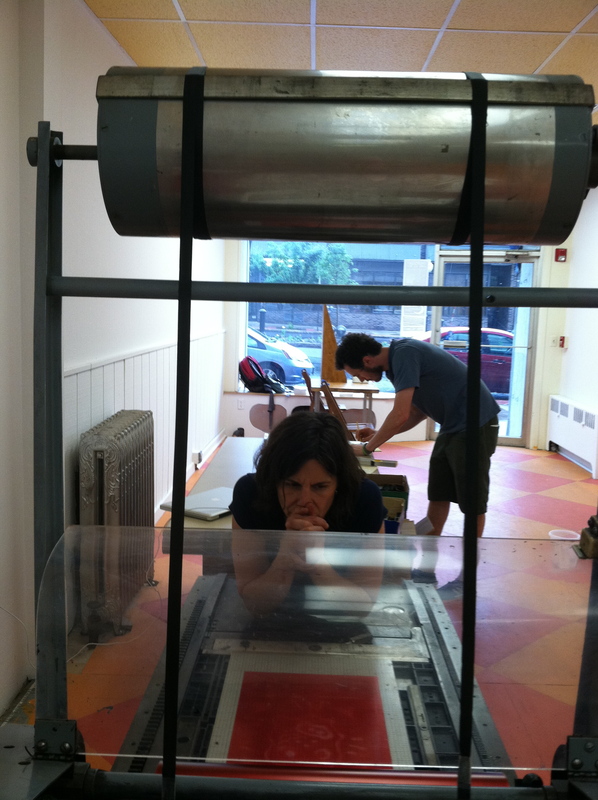 PRESS: LetterPRESS as a Public Art Project is one of the ways she does this. Mowinski began her career as an art education major at Case Western Reserve University and the Cleveland Institute of Art. After graduating, she went west to seek her fortune, teaching in Arizona and San Francisco. Ready for another adventure, she then served as a Peace Corps Volunteer on the island of St. Kitts in the Caribbean where she developed arts curricula, community-centered arts programs and her love of the outdoors.She left the tropics after three years to study in New England, earning an M.A.R. in Religion and the Visual Arts from Yale University in 1999 where she was the Katsuo Miho Scholar in Peace Making. Many seeds were planted during her time at Yale, and she let them germinate while teaching for a few years at Buxton School in Williamstown, MA. Residencies at Windgrove in Tasmania and Jentel in Wyoming kept her art practice alive during these intense years of teaching. Eventually, the seeds blossomed and led her to Philadelphia where she earned her M.F.A. in Book Arts/Printmaking from The University of the Arts (UArts) in 2006.She continues to seek out residencies and travel as opportunities of intense focus and creation. In recent years she has traveled to Denali National Park in Alaska, the Kimmel Harding Nelson Center in Nebraska, the Venezuelan Andes, a coast-to-coast journey across Costa Rica, and art fairs/shows like Art Basel, the Venice Biennial and the Armory Show. Mowinski is an AssociateProfessor of Visual Art at the Massachusetts College of Liberal Arts (MCLA) in North Adams, MA.